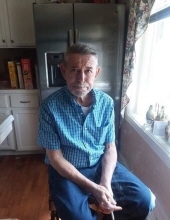 William Allen, born December 11, 1949, in Clay County, KY to Alfred and Doshie Lee Allen, passed away on April 7,2019 at the Manchester memorial Hospital, after a short illness. He was preceded in death by his parents, Alfred and Doshie Allen; two brothers: Junior Allen and Neal Allen; and two sisters: Mary Lee McQueen and Susan Elizabeth Helton. He is survived by one son, Jeffery Allen of Winchester, KY, and one daughter, Jennifer Hychs of Southgate, KY. He is also survived by three brothers: Ambrose Allen and wife Betty of Ft. Mitchell, KY, Carl David Allen and wife Sue of Maysville, KY, and Hugh Allen and wife Sue of Burning Springs, KY; by two sisters: Belle Canterbury of Cincinnati, OH, and Rosie Sams of Laurel Creek, KY; by his sister-in-law, Hazel Allen; and a host of nieces and nephews. William Allen was a member of the Crane Creek Baptist Church and he enjoyed his family and fishing. Services will be held at 2:00 PM on Thursday, April 11th at Britton Funeral Home in Manchester, KY, with Carl Allen and Henry Lloyd Deaton officiating. Burial will follow at the Maxaline Baker Cemetery on Oneida. To send flowers or a remembrance gift to the family of William Allen, please visit our Tribute Store. "Email Address" would like to share the life celebration of William Allen. Click on the "link" to go to share a favorite memory or leave a condolence message for the family.